Welcome to Altenew Educators Blog Hop! As Altenew-Certificated Educators, we were asked to share our FAVORITE ( techniques, styles.... or Altenew supplies)! If you’ve been following along, you’ve just arrived from Michelle Ochoa Murray's blog. If you find a broken link, you'll find a master list of the hop links at the Altenew Card Blog. I thought I'd share with you two cards using one of my favourite techniques, pairing delicate flowers with backdrops consisting of black and white elements. I love the fresh modern vibe it creates. 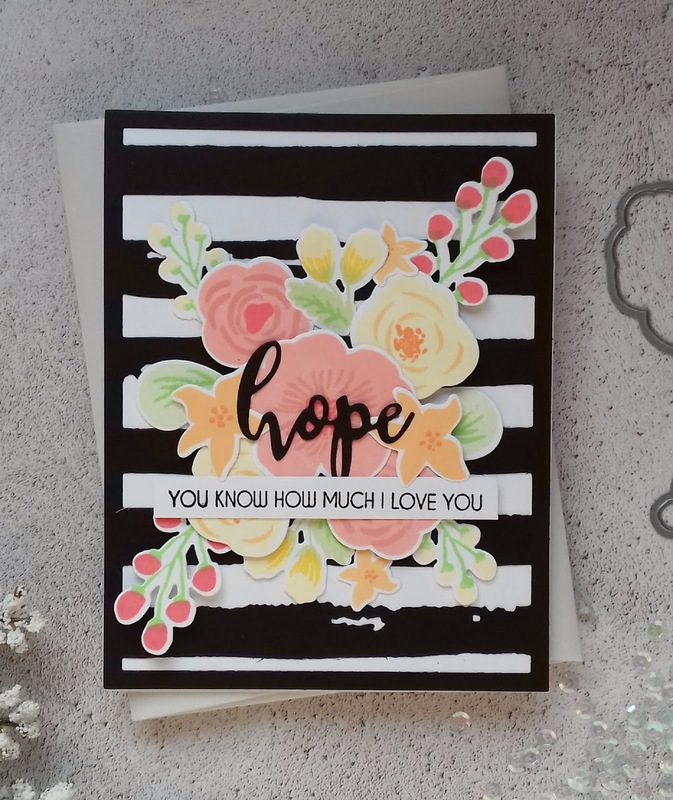 For my first card I used the Watercolor stripes cover die to create a black backdrop for my flowers to sit against. I added floral elements using the Bride to be stamp and die set. I chose to use pastel inks to give a soft feminine feel. 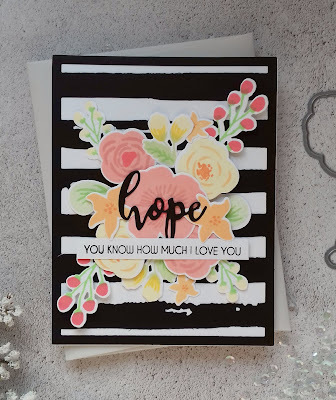 My sentiment is from the Hope stamp and die set. My next card was created using the same idea, this time I used the Layered Medallions A cover die cut in white against a black card. I used the Fine Alphabet to die but the word Hugs, which I placed on to vellum. 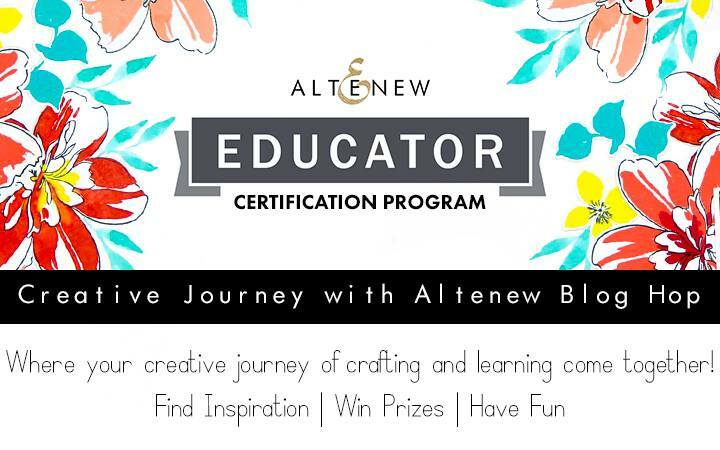 As many of you will know, Altenew is a huge part of my crafting life, I'm not only a huge fan, Certified Educator but also run the Altenew fan group on Facebook, I just can't get enough of their stunning products. When I first heard about the AECP I was ready to jump in with both feet. The program was a way for me to learn new techniques, ways to get more form my Altenew stash and take my crafting to the next level. 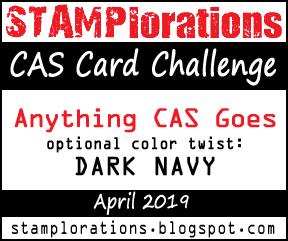 I adore Altenew's stamps, inks and dies (well in fact all of their products) They make such a difference to my crafting, if you are thinking about joining the AECP, I would say go for it. You have nothing to lose and so so much to gain. The lessons are full of hints, tips and inspiration and the support from Virginia who runs the program is fantastic. I also have a $15 gift certificate to give away, please leave me a comment below and I will pick a winner at random and announce it here on 1/22/2019. Thank you for stopping by today, take care, Terri. Love love love the dramatic backgrounds! 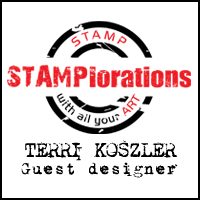 I really really love the color contrast and the layering with your beautiful creations, Terri! So glad that you are on the artistic journey with us! Thank you for joining the Altenew Educators Blog Hop today! 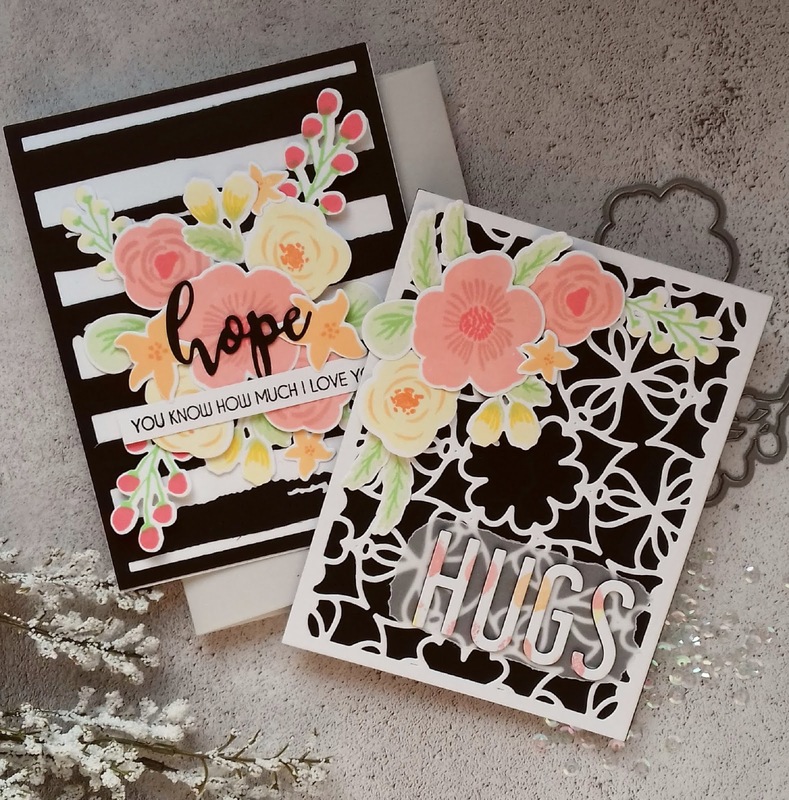 the black and white with those lovely soft pastels make two gorgeous cards, Terri! Great cards Terri! I love the combination of pretty flowers and stark black and white - makes a card look modern and up to date. Very nice cards and great use of cover dies. I love how bold these cards are. The black & white really let the colors stand out. Thank you for sharing! Love the graphic bold stripes paired with the softer colored flowers! Very impactful. These are beautiful. The flowers on the black and white create a stunning look. I love the watercolor stripes die and it's on my wish list. Beautiful cards - I love the contrast of the soft flowers and the strong graphic backgrounds. Quite breathtaking. Wow these are stunning! I've always been afraid to do black and white with colored but it's on my too do list to just go ahead and try! And you are the reason for that! Those cards are stunning! Love love love these!! I do love that look with colored flowers over black & white. Your cards are beautiful and I expecially love that striped background die! You have created such fabulous cards!! Love the mixture of black and white with bright colors. Wonderful job!! Beautiful cards and I love the black and white backgrounds! Love the black and white backgrounds! Simple but effective. The cards are fantastic. Interesting background... I really like the first one. You cards are lovely. They have a kind of art deco look to them. Love them both! I really love both of your cards. Black and pink is one of my favorite color combinations. Love the black backgrounds, really makes the colors pop. Very fresh ideas! Love the modern look! Both so charming!! I so enjoy seeing them!! Congratulations on qualifying as an Altenew Educator. Your cards are lovely! 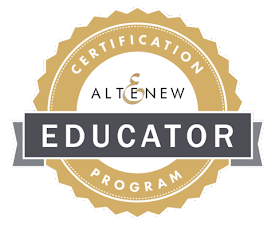 Congrats on achieving your Altenew Educator certificate! Gorgeous cards and beautiful layouts. I always love the contrast of black and white as a base for a card but never remember to apply it to my own card designs. Hi Dana Congratulations, you are the winner of the $15 gift card for the Altenew store, please email me at tkoszler@yahoo.co.uk to claim your prize. Stunning is exactly the word for your cards. I love cover plates so much. Altenew has some beauties. Thanks for sharing. Beautiful cards, Terri! I love the bold use of these techniques! I love how the colors POP from your black and white bases! Terri, your cards are stunning! Congrats on completing the program - what a great accomplishment. Your work is just lovely and I completely agree, Altenew products are just a part of my life. I too love cards with the B & W background with pastel flowers on top. I'll have to actually make one now! Stunning flowers with the black and white contrast!! Gorgeous! Love the colorful flowers with the cook black & white!! So striking! Your cards are lovely! I love the touch of color against the black and white backgrounds. So elegant! Love seeing a lot of black and whites, they are perfect combination background! Великолепные работы. Очень хотелось бы иметь в наличии спиртовые маркеры, а пока работаю с акварельными карандашами. Love your cards, Terri. I am a regular at the FB group and I really appreciate the work you put into maintaining it so well! Congrats on completing the AECP. Looking forward to more inspiration from you! You are right - the lovely florals against a black and white background is stunning! Absolutely fab!! Love the black. Totally am going to try to replicate this card, love it! Love the drama that the black and white creates. I love the contrasting colors. Beautiful. I too love a bold black background for a bright floral image. Great card. The contrast of the black and white with color is stunning!!! Thank you for the inspiration!!! Love the use of the black background. Makes everything else pop off the card. Beautiful cards! 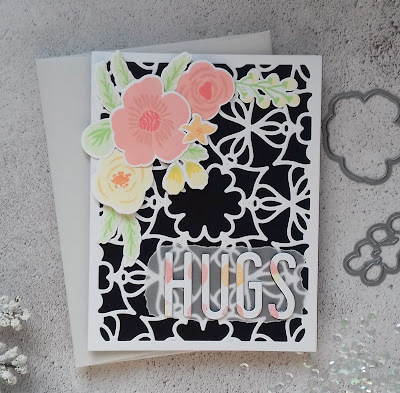 I love this fresh idea for background dies, the black and white really makes the florals pop. I am enjoying the new backgroud dies but I especially like what you did with the watercolor stripes die. It comes off as really striking. Enjoy your new adventure. Love the one with the black and white stripes I need to do that!!! thanks for the inspiration. Very pretty cards today. Thank you so much for sharing them. can't get enough of the dover dies. Love your use of lighter colors with the dramatic black and white background. Beautiful projects, Terri! I agree with you that black and white makes any colored really stand out. I love the colors and the black and white! Beautiful cards! I really like the black and white background. I see this on so many products. I love the storage containers with the b&w backgrounds. Congratulations on your achievements! WOW Terri, I can certainly see why you are an Altenew Educator, your cards are truly AMAZING! Altenew's beautiful floral's are what got me hooked on their products but in all honesty, ALL of their products are amazing! This color looks beautiful against the black and white! Very pretty ideas that look amazing! Beautiful cards! I love the b&w backgrounds and colored flowers! What a unique design with the black & white background! It really showcases the lovely flowers in the soft pastels. I can't wait to try this! Very very pretty. Your card looks like it was a lot of fun to make! Beautiful flowers and I like the black and white backgrounds. Great cards. I love black and white with a splash of color or colors. Great job. Your cards are totally delightful, love the strong black and white with those beautiful pastel colours. Thanks for sharing. Love the bold colors on the black! Love the colors over the black and white background! Casing your card! I too like the b&w backgrounds. Your cards are fabulous! Congrats on being an Altenew-Certificated Educators, you deserve it after the hardwork you put in. The colors look so pretty on the black. Love your style and colors on these cards! Beautiful cards - I need to use black in a bold way on my cards more often - it's such a stunning look! Thank you for sharing these gorgeous cards, Terri! I absolutely adore your mix of colors and the layering of your cards. It creates such great depth and dimension! Just beautiful! I, too, love cover plates, and the watercolor cover plate was made for black and white! Love it as a backdrop for colorful flowers, especially if they are Altenew layering stamp flowers! Your work is awesome, and look forward to seeing more! Gorgeous designs! Love the color schemes. Congratulations on completing the education program. Beautiful cards. I love the black backgrounds and the styles are gorgeous. Congrats on becoming an AN educator! Lovely cards Terri! Thanks for the inspiration! The black and white backgrounds do make an impressive contrast to the beautiful colorful florals! Thanks for the inspiration and for the opportunity to win! Absolutely love love the hope card. Simply gorgeous! Thanks for sharing! wow! great use of black and white!!! Beautiful cards! Love Altenew cover dies! love these cards. The black really makes the colors pop out. Thank you for sharing your cards. Congrats on being an Altenew educator! Beautiful projects, I love The pastels paired with black & white! 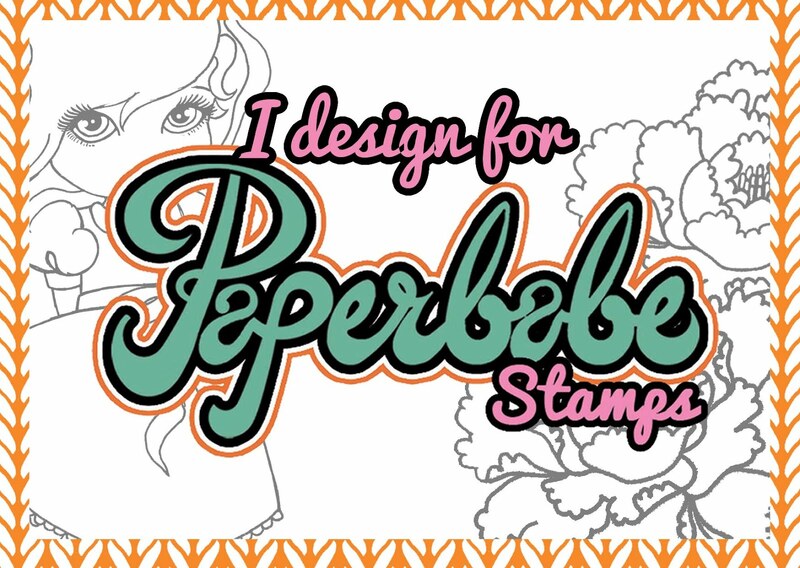 Congratulations Terri, love these soft pastels colors over the black and white die cut cover die . So pretty and cheerful. Both of your cards are pretty. Love the contrast with the black and white with the colored flowers in the front! Really beautiful cards.